Michel de Nostredame (December 14, 1503 Ц July 2, 1566), usually Latinized to Nostradamus, was a French apothecary and reputed seer who published collections of prophecies that have since become famous world-wide. He is best known for his book Les Propheties, the first edition of which appeared in 1555. Since the publication of this book, which has rarely been out of print since his death, Nostradamus has attracted an almost cult following. His many enthusiasts, as well as the popular press, credit him with predicting numerous major world events. In contrast, most of the academic sources listed below maintain that the associations made between world events and Nostradamus' quatrains are largely the result of misinterpretations or mistranslations (sometimes deliberate) or else are so tenuous as to render them useless as evidence of any genuine predictive power. Moreover, none of the sources listed offers any evidence that anyone has ever interpreted any of Nostradamus' quatrains specifically enough to allow a clear identification of any event in advance. Nevertheless, interest in the work of this prominent figure of the French Renaissance is still considerable, especially in the media and in popular culture, and the prophecies have in some cases been assimilated to the results of applying the alleged Bible Code, as well as to other purported prophetic works. Born in Saint-Remy-de-Provence in the south of France on December 14, 1503 (though a date of 21st December is also arguable), where his claimed birthplace still exists, Michel de Nostredame was one of at least nine children of Reyniere de St-Remy and grain dealer and notary Jaume de Nostredame. The latter's family had originally been Jewish, but Jaume's father, Guy Gassonet, had converted to Catholicism in around 1455, taking the Christian name "Pierre" and the surname "Nostredame" (the latter apparently from the saint's day on which his conversion was solemnized). His known siblings included Delphine, Jehan (circa 1507Ц77), Pierre, Hector, Louis (born in 1522), Bertrand, Jean and Antoine (born in 1523). Little else is known about Nostradamus' childhood, although there is a persistent tradition that he was educated by his maternal great-grandfather Jean de St. Remy Ч which is vitiated by the fact that the latter disappears from the historical record after 1504, when the child was only one year old. 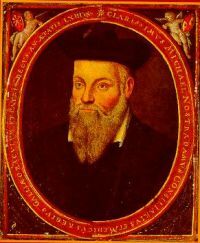 At the age of fifteen Nostradamus entered the University of Avignon to study for his baccalaureate. After little more than a year (when he would have studied the regular Trivium of grammar, rhetoric and logic, rather than the later Quadrivium of geometry, arithmetic, music and astronomy/astrology), he was forced to leave Avignon when the university closed its doors in the face of an outbreak of the plague. In 1529, after some years as an apothecary, he entered the University of Montpellier to study for a doctorate in medicine. He was expelled shortly afterwards when it was discovered that he had been an apothecary, a manual trade expressly banned by the university statutes. The expulsion document (BIU Montpellier, Register S 2 folio 87) still exists in the faculty library. However, some of his publishers and correspondents would later call him "Doctor". After his expulsion, Nostradamus continued working, presumably as an apothecary, and became famous for creating a "rose pill" that supposedly protected against the plague. In 1531 Nostradamus was invited by Jules-Cesar Scaliger, a leading Renaissance scholar, to come to Agen. There he married a woman of uncertain name (possibly Henriette d'Encausse), who bore him two children. In 1534 his wife and children died, presumably from the Plague. After their death, he continued to travel, passing through France and possibly Italy. On his return in 1545, he assisted the prominent physician Louis Serre in his fight against a major plague outbreak in Marseille, and then tackled further outbreaks of disease on his own in Salon-de-Provence and in the regional capital, Aix-en-Provence. Finally, in 1547, he settled in Salon-de-Provence in the house which exists today, where he married a rich widow named Anne Ponsarde, with whom he had six children Ч three daughters and three sons. Between 1556 and 1567, Nostradamus and his wife acquired a one-thirteenth share in a huge canal project organized by Adam de Craponne to irrigate largely waterless Salon and the nearby Desert de la Crau from the river Durance. After another visit to Italy, Nostradamus began to move away from medicine and toward the occult. Following popular trends, he wrote an almanac for 1550, for the first time Latinizing his name from Nostredame to Nostradamus. He was so encouraged by the almanac's success that he decided to write one or more annually. Taken together, they are known to have contained at least 6,338 prophecies, as well as at least eleven annual calendars, all of them starting on January 1 and not, as is sometimes supposed, in March. It was mainly in reaction to the almanacs that the nobility and other prominent persons from far away soon started asking for horoscopes and advice from him, though he generally expected his clients to supply the birth charts on which the horoscopes would be based, contrary to the normal practice of professional astrologers. He then began his project of writing a book of one thousand quatrains, which constitute the largely undated prophecies for which he is most famous today. Feeling vulnerable to religious fanatics, however, he devised a method of obscuring his meaning by using "Virgilianized" syntax, word games and a mixture of languages such as Greek, Italian, Latin, and Provencal. For technical reasons connected with their publication in three instalments (the publisher of the third and last installment seems to have been unwilling to start it in the middle of a "Century," or book of 100 verses), the last fifty-eight quatrains of the seventh "Century" have not survived into any extant edition. The quatrains, published in a book titled Les Propheties (The Prophecies), received a mixed reaction when they were published. Some people thought Nostradamus was a servant of evil, a fake, or insane, while many of the elite thought his quatrains were spiritually inspired prophecies Ч as, in the light of their post-Biblical sources (see under Literary sources below), Nostradamus himself was indeed prone to claim. Catherine de Medicis, the queen consort of King Henri II of France, was one of Nostradamus' greatest admirers. After reading his almanacs for 1555, which hinted at unnamed threats to the royal family, she summoned him to Paris to explain them and to draw up horoscopes for her children. At the time, he feared that he would be beheaded, but by the time of his death in 1566, Catherine had made him Counselor and Physician-in-Ordinary to the King. Some biographical accounts of Nostradamus' life state that he was afraid of being persecuted for heresy by the Inquisition, but neither prophecy nor astrology fell under this bracket, and he would have been in danger only if he had practiced magic to support them. In fact, his relationship with the Church as a prophet and healer was excellent. His brief imprisonment at Marignane in late 1561 came about purely because he had published his 1562 almanac without the prior permission of a bishop, contrary to a recent royal decree. By 1566, Nostradamus' gout, which had plagued him painfully for many years and made movement very difficult, turned into oedema, or dropsy. In late June he summoned his lawyer to draw up an extensive will bequeathing his property plus 3,444 crowns (around $300,000 US today) Ч minus a few debts Ч to his wife pending her remarriage, in trust for her sons pending their twenty-fifth birthdays and her daughters pending their marriages. This was followed by a much shorter codicil. On the evening of July 1, he is alleged to have told his secretary Jean de Chavigny, "You will not find me alive at sunrise." The next morning he was reportedly found dead, lying on the floor next to his bed and a bench (Presage 141 [originally 152] for November 1567, as posthumously edited by Chavigny to fit). He was buried in the local Franciscan chapel (part of it now incorporated into the restaurant La Brocherie) but re-interred in the Collegiale St-Laurent at the French Revolution, where his tomb remains to this day. The Prophecies. In this book he compiled his collection of major, long-term predictions. The first installment was published in 1555. The second, with 289 further prophetic verses, was printed in 1557. The third edition, with three hundred new quatrains, was reportedly printed in 1558, but nowadays only survives as part of the omnibus edition that was published after his death in 1568. This version contains one unrhymed and 941 rhymed quatrains, grouped into nine sets of 100 and one of 42, called "Centuries". Given printing practices at the time (which included type-setting from dictation), no two editions turned out to be identical, and it is relatively rare to find even two copies that are exactly the same. Certainly there is no warrant for assuming Ц as would-be "code-breakers" are prone to do Ц that either the spellings or the punctuation of any edition are Nostradamus' originals. The Almanacs. By far the most popular of his works, these were published annually from 1550 until his death. He often published two or three in a year, entitled either Almanachs (detailed predictions), Prognostications or Presages (more generalized predictions). Nostradamus was not only a diviner, but a professional healer, too. It is known that he wrote at least two books on medical science. One was an alleged "translation" of Galen, and in his so-called Traite des fardemens (basically a medical cookbook containing, once again, materials borrowed mainly from others), he included a description of the methods he used to treat the plague Ч none of which, not even the bloodletting, apparently worked. The same book also describes the preparation of cosmetics. A manuscript normally known as the Orus Apollo also exists in the Lyon municipal library, where upwards of 2,000 original documents relating to Nostradamus are stored under the aegis of Michel Chomarat. It is a purported translation of an ancient Greek work on Egyptian hieroglyphs based on later Latin versions, all of them unfortunately ignorant of the true meanings of the ancient Egyptian script, which was not correctly deciphered until the advent of Champollion in the 19th century. Since his death only the Prophecies have continued to be popular, but in this case they have been quite extraordinarily so. Over two hundred editions of them have appeared in that time, together with over 2000 commentaries. Their popularity seems to be partly due to the fact that their vagueness and lack of dating make it easy to quote them selectively after every major dramatic event and retrospectively claim them as "hits". Andrew Novikov ЂThe USA and Russia in the predictions of Nostradamusї. 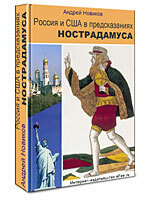 Super book bestseller about history of the USA and Russia in the predictions of Nostradamus. The prophecies retold and expanded by Nostradamus have figured largely in popular culture in the 20th and 21st centuries. As well as being the subject of hundreds of books (both fiction and nonfiction), Nostradamus' life has been depicted in several films and videos, and his life and writings continue to be a subject of media interest. Whot predicted Nostradamus really?